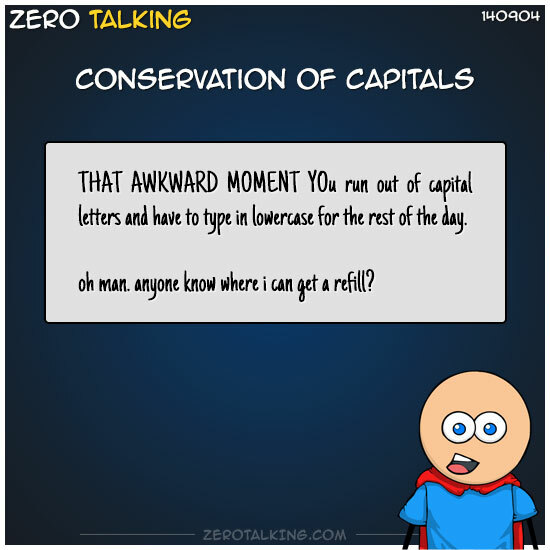 THAT AWKWARD MOMENT YOu run out of capital letters and have to type in lowercase for the rest of the day. oh man. anyone know where i can get a refill? Simone: In Washington, D.C., of course. Zero oh, simone, those letters in dc are corrupt! Simone: Oh, you want non-corrupted ones.. I see.. well, in this case, you’ll have to get yourself some lowercase letters and nurture them until they’re grown up into non-corrupted uppercases. Zero: oh, i like that idea. i can also teach these letters the law. i hope i don’t get any bed wetter letters. Simone: There’s always a certain risk with those young ones.. also watch out for those playful i’s. They tend to throw their dots around and lose them as soon as you leave them out of your sight for a moment. Zero: holy crap, karin! don’t waste ’em when there is a shortage going on! Zero: ah, i am not sure those high carb capitals are compatible with my phone, mark, but i will check! Chad W: I always feel bad for using the wrong letter, or a lowercase when it shoulda been a capital, and I have to delete it. I mean, to grow up waiting for your time to shine when the keyboard finally requests you, and it wasn’t you they truly wanted. I wonder if they go back into a waiting pool or if they are just wiped clean from existence? Sad either way. it has come to my attention that there is an unprecedented shortage of capital letters on my page today. for the sake of conservation, please use uppercase letters sparingly until we can get this whole capital letter shortage issue worked out. we are uncertain as to who or what caused this shortage, but please know that we have a crack team of letter specialists working on the issue. if you happen to be one of the few people finding themselves with more capital letters than needed today, please be kind and consider donating them to someone in need of a bit more volume. updates will follow throughout the day as we get a handle on this situation. Chad: would that be considered a “capital” offense? Zero: i was running with “typing to endanger”. Gabriella: i will absolutely donate anything i have,that would give someone more volume. anything it takes to have them heard. my sources are now telling me that excessive use of uppercase letters is a “capital offense” and considered “typing to endanger”. fines will be doubled when failing to reduce uppercase usage in a capital letter conservation zone. Zero: thanks, chad, but i really need z’s. maybe someone else can use your letters? maybe we need to open a capital letter trading company? Zero: wait, chad… did you just use up your extras by mentioning them by proper name! ?